We all know that the final fight is gonna be a 1-on-1 between Godzilla and Ghidorah. The real question is: How Will Godzilla Beat Ghidorah? Personally, I'd like to see what Godzilla did back in '91, where he blew off Ghidorah's Middle head, taking out his wings immediately afterwards, ending his chance to escape. I know there's a whole frenzy going around that Burning Godzilla is in the movie, and when I looked at the scene in the second trailer, it did look like something reaching out to grab something. You could easily make out the difference between the arm and body of the creature. (I say creature because nobody really knows if it's Godzilla or something else, it's all just speculation as of now) Who knows, maybe Godzilla gets kicked around, and is close to death during the final fight, and as Ghidorah is about to finish him off, Rodan comes out of nowhere and saves Godzilla, but he is mortally wounded in the process. He may land on top of Godzilla and transfer his energy to Godzilla like he did in '93. Rodan sadly dies in the process, (Like in '93) but Godzilla becomes supercharged. In '93, Godzilla's Atomic Breath became the insanely overpowered Red-Spiral Ray. He may obtain this ability in the final fight, but his body becomes burning hot in the process, changing from a dark gray/black color, to a burning Red. This would most-likely be a temporary state for him, but it would be SOOOOOO awesome to see. Until May 31st, we can only guess. I'd also like to hear your theories, because I feel like people can enjoy themselves in coming up with things that make sense in Godzilla movies. Post 'em below! 9 Responses to How Is Godzilla Going To Beat Ghidorah? I do not think that the final battle will be 1v1. In the trailer, we can see Mothra and Rodan flying next to eachother. Honestly, I think getting a power-up from Mothra and/or Rodan might be the way to go. During the end of the trailer, Godzilla's dorsal plates are constantly glowing, which could signify that he's currently powered up. I think that the key to defeating Ghidorah will be him gaining further energy to overwhelm his rival. The Hood: That's an interesting possibility. Kong and Godzilla teaming up to fight Ghidorah. TheGMan123: It seems more likely that something like that would happen. Godzilla (As far as I know) stands at only 108 meters. Ghidorah, however, is 50 meters taller, standing at 158 meters. Godzilla is more or less at the height disadvantage against Ghidorah, not to mention that Ghidorah has 3 separate heads with different personalities, as well as his iconic Gravity Beams and creating a huge electrical storm whenever he flies. We don't exactly know how Ghidorah will actually behave like in the movie, and the only thing that we see is him wanting to destroy as much as he possibly can; I'm saying that we only see his aggressive personalities in the clips from the second trailer. SPOILER ALERT: A person who has already seen the test screening of the movie says that when Godzilla and Ghidorah have their first fight, the military uses a weapon called the "Oxygenator" It's pretty much the modern-day Oxygen Destroyer. The damage that is done to the two fighting Kaiju (Or Titans, whatever) is unbalanced. Godzilla is badly injured from the weapon, while Ghidorah is unscathed. If this happens towards the start of the movie, it may show Godzilla slowly recovering throughout the movie. 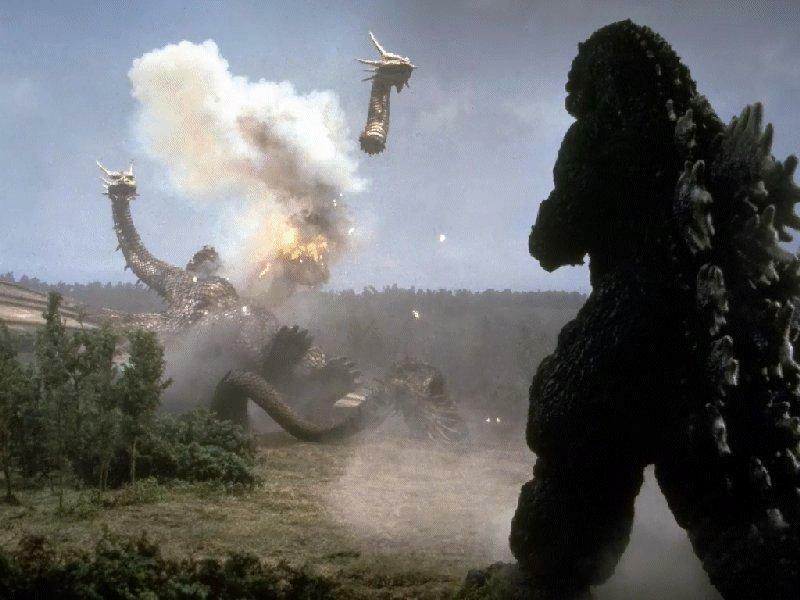 When the final fight begins, Godzilla may be weaker than he was when he first fought Ghidorah, ultimately leading to a possible burst of power from either Mothra or Rodan. I don't really think that Kong is gonna team up with Godzilla in 2020 to fight Ghidorah again. If you didn't know already, Mike Dougherty tweeted a picture of the Oxygen Destroyer. Long story short, people are thinking that Destoroyah is going to appear as the main villain in the film, and after fighting each other already, Godzilla and Kong will team up to fight Destroyah. @Godzilla's tail I wish! I wouldn't mind a final wars/ showa level of OP tbh. Godzilla seems to have much fuller dorsal plates and in the final shot of the second trailer is basically larger than Ghidorah in terms of musculature; Ghidorah's necks look like noodles in comparison. i hope in it's own way it goes down similar to the fight between toothless and the bewilder-beast in the sense that Godzilla establishes dominance over Ghidorah (preferably in a similar fashion to how real reptiles such as lizards and crocodiles do such as biting on the snout and neck) and after proving he is the alpha the Mothra and Rodan submit to him then proving his ability to handle Ghidorah the others join in just to finish Ghidorah off.